Fig. 1 Paper wreath with a voice recorder as a centerpiece. On June 1, 2015, Gov. Greg Abbott signed S.B. 11, also known as the campus carry law. S.B. 11 provides that license holders may carry a concealed handgun throughout university campuses, starting Aug. 1, 2016. Faculty members who are solely assigned to an office are permitted to prohibit the concealed carry of a handgun in that office. If faculty members choose to exercise this discretion, they must provide oral notice that the concealed carry of a handgun is prohibited in their offices. Oral notice is the only legally effective way to provide notice about the prohibition. All employees are permitted to post signage in their office or include language in their syllabi. However, such signage or language is not a legally effective substitute for oral notification (https://campuscarry.utexas.edu). In this FMS event, we will share how we are currently “choos(ing) to exercise this discretion.” Some of us are using a voice recorder as a doorbell, others may show the posters or written statements used in their offices, and some may demonstrate how they perform the statement aloud with students. 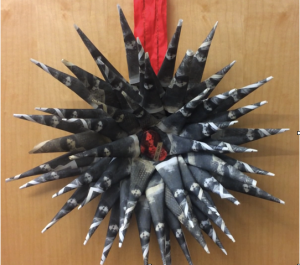 In community, participants can choose to create a door wreath, which presents the doorbell/recorded button as a center feature, masked in a welcoming, household ornament.